It’s time to celebrate the new year and bring in 2017 with a bang! 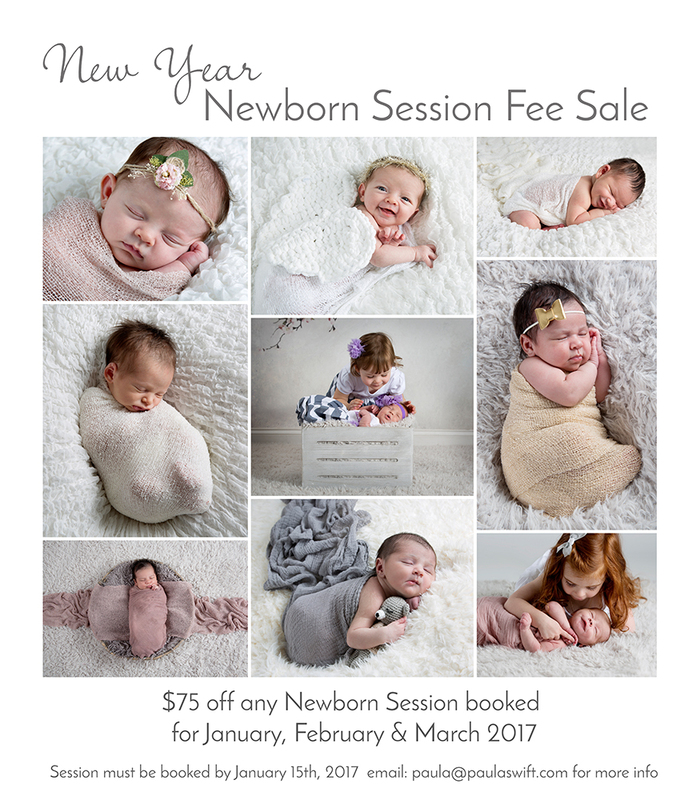 Time for our annual Newborn Photography Session Fee Sale. booked for JANUARY, FEBRUARY or MARCH 2017. Session must be booked by January 15th, 2017 to qualify for this discount. Email paula@paulaswift.com to book your Newborn session. Newborns 4 weeks and under. For babies not born yet, we book a tentative date out about 10 days out from your due date so we don’t over book a certain week of unpredictable newborns. Once your baby is born, then we will confirm what date works best for both. Paula Swift is an award-winning newborn photographer who is a Master Photographer and Certified Professional Photographer. She has been a professional photographer for 22 years, she is a wife, a mom to three sons , an author and teaches newborn photography to local photographers. Paula Swift Photography is an award winning Framingham newborn photographer who’s studio is located on Rt 20 Sudbury not far from Boston and Worcester, Massachusetts. Newborn Photography Session Sale that has $75 off newborn photography sessions at Paula Swift Photography in Sudbury, MA. Offering newborn sessions in Sudbury for families from Natick, Weston, Dedham, Needham , Shrewsbury, Westoborough, Concord, Arlington, Winchester, Lexington, Wellseley and many more Metrowest towns. Paula Swift Photography offers a beautiful studio for newborns and new families in Sudbury and Framingham. Paula knows how to light a newborn correctly with her professional photography experience for over 22 years. If you are looking for a Framingham Newborn Photographer or a Natick baby photographer who travels to your home, Paula Swift Photography is the best photographer for you – please visit Paula Swift Photography’s website for more info on our award-winning newborn photography sessions. Newborn Photography sessions are booked for babies 5 days to 4 weeks old. If you are looking to have those sleepy newborn baby poses, those ages are suggested. Please plan ahead and book while you are pregnant to get on our busy newborn photography session schedule. We can easily move your date up or back depending on when your baby is born. We can’t guarantee any newborn sessions to those who don’t book in advance. Paula Swift is a Master Photographer and a Certified Professional Photographer in Sudbury MA who offers a unique commercial photography studio loft or will come to your home. Paula Swift Photography is a fully insured and licensed business in the Commonwealth of Massachusetts. Offering Boston Newborn Photography, In home newborn sessions in Metrowest, newborn sessions in Grafton, Weston, Wayland, Westwood, Belmont, Arlington and Sudbury Photography Studio. Paula Swift Photography offers newborn session in Marlborough, Natick, Wellesley and in your Dedham homes. Your newborn baby can also be captured in Paula Swift Photography, Inc.’s unique 1200 sq foot Sudbury boutique studio. Paula offers a wide variety of newborn sessions to fit your needs and style. If you are looking for a Boston Baby Photographer visit www.paulaswift.com for more info. Newborn Photography, Boston Baby Photographer and at it’s best by Paula Ferazzi Swift. Paula Swift Photography, Inc. is one of the few professional photography award-winning studios that is in the Metrowest Boston area. Paula Swift has been a professional photographer for 22 years. Paula Swift Photography featured as Boston’s Best Family Photography by CBS Boston in 2015. Paula Ferazzi Swift also offers photography classes on her newborn photography and photojournalism through the Professional Photographers of Massachusetts and her photography studio. click on Photography Classes link above for more info on current classes.